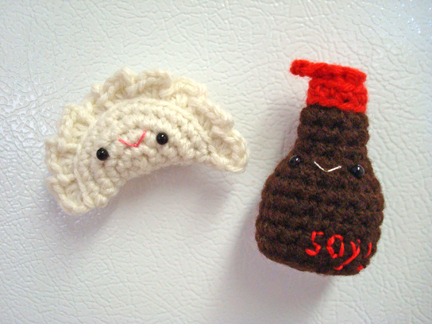 I’m making this as a wedding gift for a friend who first met her fiancé at a dumpling gathering! 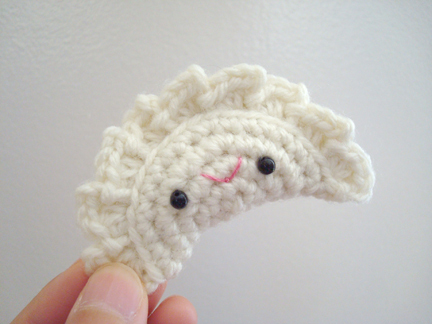 Dumpling is made by crocheting a circle, which is then folded in half and seamed together with a scalloped edge. ch 3, 5 sc in 3rd ch from hook, 2 sc in top of beginning ch, 2 sc in each of next 4 sc, sc in next sc, repeat [2 sc in next sc, sc in next sc] until piece measures 1 3/4 inches across. Then, repeat [1 sc in each of next 5 sc, 2 sc in next sc] until piece measures 2 1/4 inches across. Then sc in next sc, sl st in next sc. Don’t fasten off. [ch 2, 3 hdc in next st, sl st in next st] 4 times. Leave hook on loop, sew on the eyes and mouth. 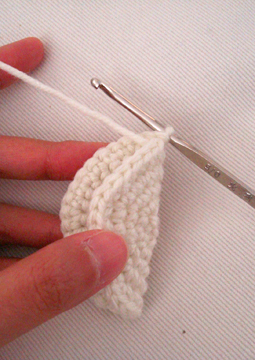 Continue with repeats of [ch 2, 3 hdc in next st, sl st in next st] across until there are 3 or 4 stitches left. Stuff dumpling, then complete scalloped edge, fasten off. Now on to the bottle of soy sauce. It’s made in rounds, and each round ends with a sl st into the first sc of the round. Round 1: ch 3, 5 sc in 3rd ch from hook, sl st in top of beginning ch. Round 2: ch 1, sc in same st, 2 sc in each sc around, sl st in first sc. Round 3: ch 1, sc in same st, [sc in next sc, 2 sc in next sc] 6 times, sl st in first sc. Round 4: ch 1, sc in same st, through back loop only, 1 sc in each sc around, sl st in first sc. Round 5: repeat row 4, except work each stitch through both loops. Round 6–8: repeat row 5. Don’t fasten off. 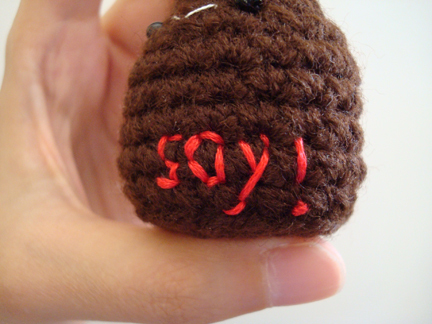 I embroidered “soy!” on the bottle at this point. Cut a round piece of cardboard (I cut mine from a frozen pizza box) about the size of the bottom of the bottle and place it into the bottom of the bottle. This way the bottom will stay flat when the bottle is stuffed. Round 9: ch 1, sc in same sc, [2 sc tog, sc in next sc] around, sl st in first sc. Round 10: repeat row 9. Sew on eyes and mouth. Round 11–13: ch 1, sc in same sc, 1 sc in each sc around, sl st in first sc. Fasten off. Round 1: Join red where brown is fasten off, sl st in each sc around in front loop only. Round 2: ch 1, sc in same st, through top loop only, 1 sc in each st around, st sl in first sc. 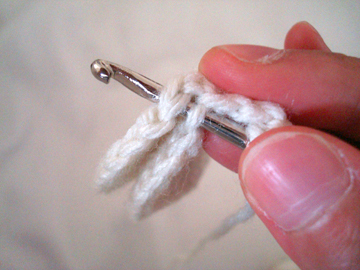 Leave a 6″ tail for sewing, fasten off. Stuff bottle firmly to keep shape. Round 1: work 6 sc in magic ring, sl st in 1st sc. Round 2: ch 3, dc in next sc. Fasten off. 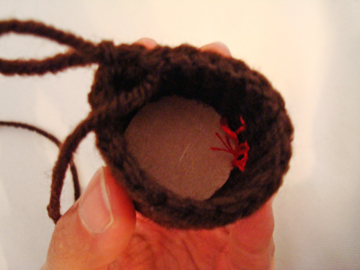 Sew top of cap to top of bottle, weave in ends. 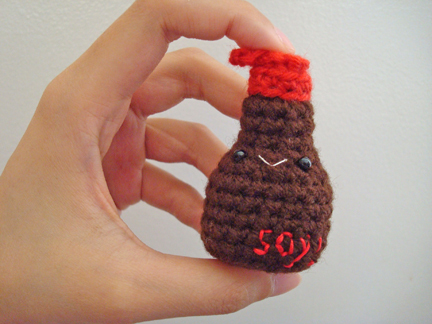 I absolutely LOVE this adorable dumpling and soy sauce! Great pattern :) And thanks for the shout‐out about my siu mai too! Love all your dainty, cute work Trish! SO, cute!!!!!! i am 13 and i think i might just have to make this. but since i don’t have brown, ill stick with the dumpling. Thanks!!!!! thank you so much for visiting, audrey! :D happy crocheting! i’m hoping for the best! Oh,and why do you call your sight genuine mudpie anyway? Hey, this is really cute! How would I make these on a bigger scale though? 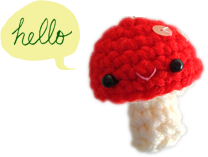 Pingback: Play with Your Food: 40 Free Amigurumi Patterns to Crochet Today! Pingback: Chinese New Year | YarnPaint! After 12 years of living in China, I have finally been invited to join a good friend and her family for Lunar New Year (Spring Festival)Dinner. Guess what’s getting passed out as we eat the real ones at midnight?!?!?!? EXCITED!!! Do I sc from the chain 1 that I’ve just made? Or do I sc from the loop where the chain originated from? Sorry about the delay in responding! Yes you would sc from the loop where the chain originated from. Thank you for giving the pattern a try!